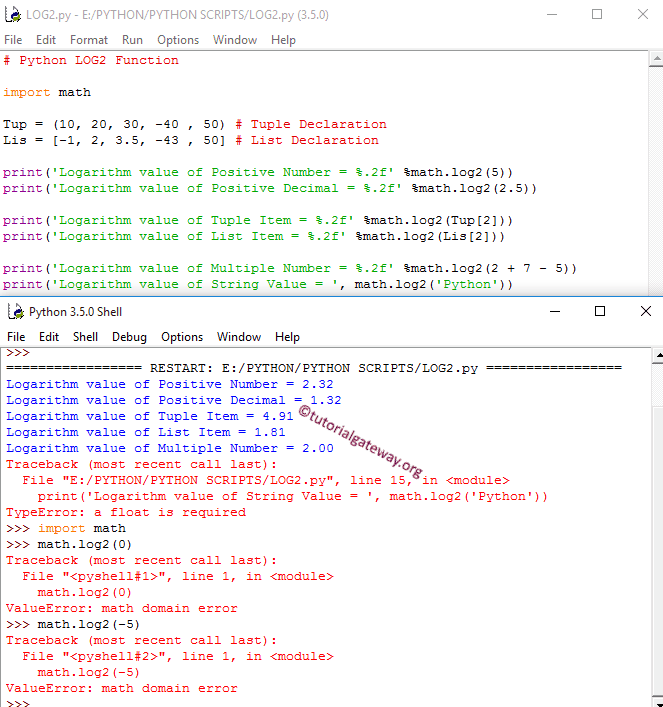 The Python LOG2 function is one of the Python Math function which is used to calculate the logarithmic value of given number of base 2. In this article we will show you, How to use LOG2() function in Python Programming language with example. TIP: This function is more accurate than math.log(x, 2). Please refer Python LOG article to understand the log function. If the number argument is positive number, LOG2() function will return the output. If the number argument is not a number, LOG2() function will return TypeError. The Python LOG2 Function is used to calculate the logarithmic value of given number of base 2. In this Python log2 function example, At the beginning, We declared Python List and Tuple with some random values. Within the first two statements, We used the LOG2() Function directly on Positive integer and Decimal values. Next two statements, We used the LOG2() Function on Python Tuple and List items. If you observe the above screenshot, LOG2() function is calculating the logarithm value of base 2.